Swaminarayan Akshardham Temple located in Delhi represents the tradition, essence, architecture and the main timeless spirituality built in modern time. The temple, which attracts approximately 70 percent of all tourists who visit Delhi, was officially opened on 6 November 2005. It is the centre of attraction of capital. 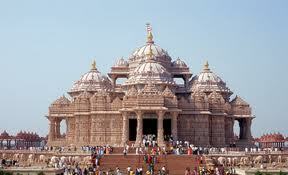 So your visit to Delhi is completed only when you visit to Swaminarayan Akshardham Temple. BAPS Swaminarayan Akshardham Mandir in New Delhi, India, is the world's largest comprehensive Hindu temple. It measures 356 ft (109 m). long, 316 ft (96 m). wide and 141 ft (43 m). high, covering an area of 86,342 sq ft (8,021.4 m2). The grand, ancient-style, ornately hand-carved stone temple has been built without structural steel within five years by 11,000 artisans and volunteers. His Holiness Pramukh Swami Maharaj, revered spiritual leader of BAPS, consecrated the temple on 6 November 2005. 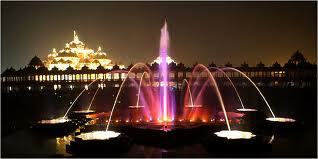 Akshardham showcases the essence of India's ageless art, borderless culture and timeless values. How to Reach Akshardham Mandir:- From New Delhi railway station it is only 9-10 Km far. And from Nizamuddin Railway Station it is 4Km far. So there is availability of auto rickshaw to reach but before that there is a best option i.e. Akshardham metro station nearby Akshardham temple. You can take metro from New Delhi metro station to Akshardham station. Timings of Akshardham Mandir:- You can visit temple from Sunday to Saturday between 9 AM-7 PM but do not forget that the entire temple is closed on Monday. It will take minimum 3-4 hours to visit Akshardham. From October to March, Murti Darshan and Exhibitions close one hour earlier. Hall of Values:- Also known as Sahajanand Pradarshan, the Hall of Values features life-like robotics and dioramas which display incidents from Swaminarayan's life, portraying his message about the importance of peace, harmony, humility, service to others and devotion to God. The Sahajanand Pradarshan is set in 18th century India and displays of 15 dioramas through robotics, fiber optics, light and sound effects, dialogues, and music. The hall features the world's smallest animatronic robot in the form of Ghanshyam Maharaj, the child form of Swaminarayan. Giant Screen Film- Theatre:- Named Neelkanth Kalyan Yatra, the theatre houses Delhi's first and only large format screen, measuring 85-foot (26 m) by 65-foot (20 m). The theatre shows a film specially commissioned for the complex, Neelkanth Yatra, to recount a seven-year pilgrimage made by Swaminarayan made during his teenage years throughout India. Mystic India, an international version of the film called, was released in 2005 at IMAX theatres and giant screen cinemas worldwide. A 27-foot (8.2 m) tall bronze murti of Neelkanth Varni is located outside the theatre. Boat Ride: - Named Sanskruti Vihar, this ride takes visitors on a journey through 10,000 years of Indian history in approximately 12 minutes. Visitors sit in specially designed peacock shaped boats that make their way around an artificial river, passing through a model of Takshashila, the world's first university, chemistry laboratories, ancient hospitals, and bazaars, finally ending with a message expressing hope for the future of India. Musical Fountain: - Known as the Yagnapurush Kund, it is India's largest step well. It features a very large series of steps down to a traditional yagna kund. During the day, these steps provide rest for the visitors to the complex and at night, a musical fountain show representing the circle of life is played to an audience which is seated on the same steps. The fountain is named after the founder of the Hindu organization, Shastriji Maharaj. The fountain measures 300 feet (91 m) by 300 feet (91 m) with 2,870 steps and 108 small shrines. In its center lies an eight-petaled lotus shaped yagna kund designed according to the Jayaakhya Samhita of the Panchratra shastra. Garden of India: - Also known as the Bharat Upavan, this garden has lush manicured lawns, trees, and shrubs. The garden is lined with bronze sculptures of contributors to India's culture and history. These sculptures include children, women, national figures, freedom fighters, and warriors of India. Of these figures, the more notable figures include the national figures such as Mahatma Gandhi.